This weekend Bermuda received more bad news from another cruise line. Apart from the fact that Holland America will end its weekly service from New York to the island’s capital Hamilton in two weeks, Royal Caribbean has now announced that it will reduce the number of berths it offers to Bermuda next year by 20%. Not only that but its new Baltimore ship, which is where the reductions will occur, has 15% less capacity than the ship she replaces. Meanwhile, Costa Cruises has commenced a trial recycling program on board Costa Pacific that will look for further efficiencies in shipboard waste management and recycling. And finally, we have a look at how the Eurozone problems and a weak Spanish economy are affecting the Spanish cruise market. Two weeks before Holland America Line’s 1,346-passenger Veendam departs New York on her final cruise to Hamilton, Bermuda, comes news that yet another cruise line is cutting back the number of its Bermuda calls, this time from fifty-five to forty-four, a further reduction of eleven cruises. This weekend, Royal Caribbean announced that it was going to reduce the number of Baltimore to Bermuda sailings next year on its 1,950-passenger Grandeur of the Seas, which will replace the 2,252-berth Enchantment of the Seas. Instead, the Grandeur will alternate between Bermuda and Bahamas next year, making only fifteen cruises to Bermuda’s Dockyard. Not only will there be ten fewer Bermuda cruises from Baltimore but the berth capacity of the Grandeur is 15% less, meaning an effective reduction of almost half in the number of Baltimore passengers able to cruise to Bermuda. This comes as a result of Royal Caribbean wanting to give its Baltimore guests more choice in their destinations. The 3,114-berth Explorer of the Seas, meanwhile, will undertake twenty-nine cruises from New York to Bermuda compared to thirty this year. The number of Baltimore to Bermuda cruises will fall from twenty-five this year to fifteen next. On top of the change in plan, it has also been reported that some of Royal Caribbean’s Bermuda cruises were not selling that well. By the end of this month, three major cruise lines, all owned by Carnival Corp & plc, will have either eliminated or reduced their Bermuda cruises. Carnival Cruise Lines visited Bermuda sixteen times in 2011, but just once this year. 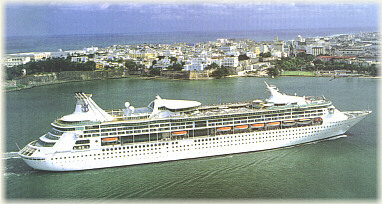 And Princess Cruises, which called in Bermuda ten times in 2011, has just two calls scheduled for 2012. On top of this, Holland America Line will drop its regular service later this month. As no replacement has been found, regular cruise ship visits to Hamilton will become a thing of the past after the Veendam leaves New York on her final voyage on August 26. Thereafter, she transfers to the Canada/New England trade. The Veendam, the only ship sailing regularly into Hamilton for the past three years, will have made nineteen trips this year, but will not return in 2013. Meanwhile, the Bermuda Government is hoping to lure more small ships into Hamilton and St Georges to make up for the drop in numbers. Also, officials are said to be talking to Disney Cruise Line. Small ship operators that have been identified include Azamara Club Cruises, Regent Seven Seas and Silversea, who have each sent occasional callers. Indeed the Azamara Journey did a full Bermuda season on 2007. Other ships that have been identified include Princess Cruises’ 688-berth Pacific Princess and Holland America’s 837-berth Prinsendam, both of which make occasional Bermuda calls. The only good news in Bermuda is that Norwegian Cruise Line’s new 4,000-berth Norwegian Breakaway will substantially increase their Bermuda capacity next year. But one also wonders whether Bermuda should not be going after more of the old formula of weekly cruises from New York that served both Bermuda and Nassau, or even Florida for that matter. 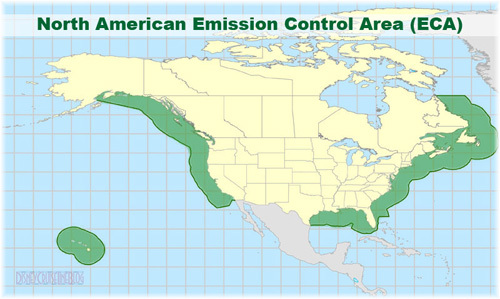 The only other thing going for Bermuda may be the new North American Emission Control Area that came into effect on August 1 and applies to a 200-mile limit from the US coast. Ships sailing to Bermuda can still burn the cheaper heavy bunker fuel once outside the ECA, and Bermuda, unlike Alaska and Canada/New England, is 697 nautical miles from New York and 683 from Norfolk, well outside the ECA. An industry first is about to take place on board Costa Cruises’ 3,780-berth Costa Pacifica when three waste streams will be studied in detail in an effort to improve shipboard waste management and recyclying. The three streams are packaging, biodegradable waste and paper, and the goal is to reduce, recycle and reuse. The new EU-funded project, known as Sustainable Cruise, is being managed by Costa Cruises, working together with RINA Services, Medcruise and a number of Italian partners. The project dovetails with Costa’s own waste management policy, which has been applied fleetwide for some time now. Costa’s present policy calls for 100% separation of on board solid waste, with separate storage and disposal of seven streams: glass, plastic, metal, food, paper, ceramics and aluminum. The 2009-built Costa Pacifica has been chosen as pilot ship for the project, the scope of which will also include coordination with European port waste disposal facilities to promote port cooperation in waste management, a specific area where Medcruise will get involved. The ultimate aim of the Costa Pacifica project is to provide stimulus for the implementation of an EU directive on shipboard waste, as well as to create further incentives for waste reduction, recycling collection and reuse. The project also aims to set up a new voluntary certification scheme for shipboard waste management and its effects in terms of CO2 reduction, possibly paving the way for the introduction of specific EU environmental legislation for shipping. In the area of packaging — cardboard boxes, glass bottles, and plastic bottles and containers — it is proposed to work with suppliers to reduce this type of waste at origin. Further action is planned for food and other organic waste, which account for 22% of total waste on the Costa Pacifica. In compliance with IMO Marpol laws protecting the marine environment, food waste is now collected and processed by shredders, crushers and compactors to reduce it before its is discharged overboard as fish food. Under the Sustainable Cruise program, however, the pulp produced from food waste will be processed into a useful by-product such as compost. The third category, paper, accounts for about 16% of waste on board Costa Pacifica. Sustainable Cruise has already analysed the supply, storage, use and disposal of paper on board and is now focusing on devising processes that will reduce paper at source, reuse it or dispose of it sustainably. 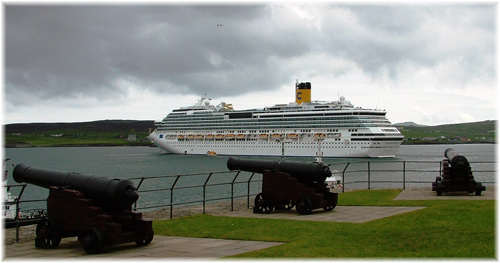 Some good news perhaps after too much new about sister ship Costa Concordia. The Costa Pacifica has been cruising this summer primarily in northern Europe, including Norway, the Baltic, Spitsbergen and Iceland. Royal Caribbean Cruises has recently been keeping a close eye on the Spanish economy lest the effects of eurozone problems should have an effect on its Spanish brand Pullmantur Cruises. It had already revealed, for example, that its proportion of Spanish passengers had dropped from 85% to 40%, achieved largely thtough numerous winter charters in Brazil and also because of its more recent expansion into the French market. Pullmantur now operates three ships, the 2,306-berth Sovereign, the 1,600-berth Empress and the 1,378-berth Zenith, as well as the Horizon, sister ship of the Zenith, which it transferred this spring to its French brand Crosières de France to replace the Bleu de France, sold on to Saga. 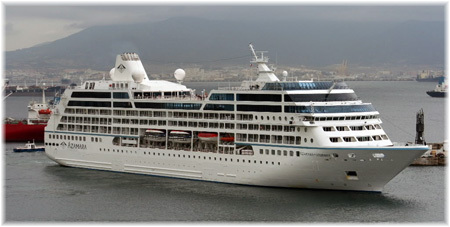 A fifth ship left the fleet this spring when the 1,022-berth Ocean Dream was chartered to Japan’s Peaceboat for world cruising. The Ocean Dream followed an earlier Pullmantur ship, the turbine-powered Oceanic, which has now gone for scrapping. The Spanish economy has already clained the smallest Spanish operator, Happy Cruises, formerly Quail Cruises, which went out of business last September. Of its three vessels, the 800-berth Gemini and 1,076-berth Ocean Pearl were returned to International Shipping Partners of Miami and laid up at Tilbury while the 650-berth Happy Dolphin was delivered back to her Greek owners and has now been chartered to Turkish operator Apex Tur. The Gemini was used as an accommodation ship during the 2012 London Olympics just ended, alongside Fred Olsen’s 930-berth Braemar, her once sister ship prior to being lengthened by Fred Olsen. Ocean Pearl has meanwhile been sold to Far East buyers, who accepted delivery in April. Meanwhile, over at Carnival Corp & plc’s Iberocruceros brand, Costa, which manages Ibero, took the 840-berth Grand Voyager off their hands earlier this year when she became the Costa Voyager, thus reducing the Iberocruceros fleet from four ships to three.